Do you use arxiv-sanity-preserver? Leave a review! 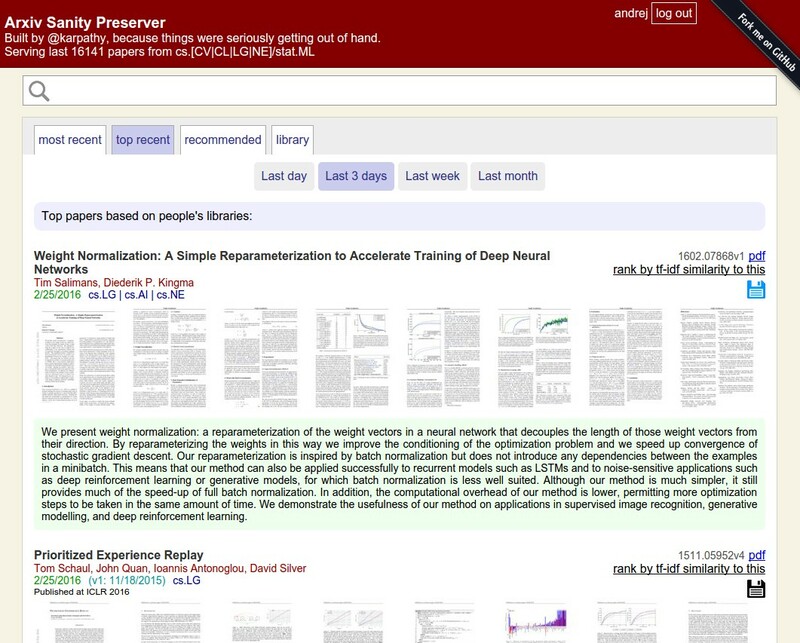 This project is a web interface that attempts to tame the overwhelming flood of papers on Arxiv. It allows researchers to keep track of recent papers, search for papers, sort papers by similarity to any paper, see recent popular papers, to add papers to a personal library, and to get personalized recommendations of (new or old) Arxiv papers. This code is currently running live at www.arxiv-sanity.com/, where it's serving 25,000+ Arxiv papers from Machine Learning (cs. [CV|AI|CL|LG|NE]/stat.ML) over the last ~3 years. With this code base you could replicate the website to any of your favorite subsets of Arxiv by simply changing the categories in fetch_papers.py. Indexing code. Uses Arxiv API to download the most recent papers in any categories you like, and then downloads all papers, extracts all text, creates tfidf vectors based on the content of each paper. This code is therefore concerned with the backend scraping and computation: building up a database of arxiv papers, calculating content vectors, creating thumbnails, computing SVMs for people, etc. User interface. Then there is a web server (based on Flask/Tornado/sqlite) that allows searching through the database and filtering papers by similarity, etc. You will also need ImageMagick and pdftotext, which you can install on Ubuntu as sudo apt-get install imagemagick poppler-utils. Bleh, that's a lot of dependencies isn't it. Run fetch_papers.py to query arxiv API and create a file db.p that contains all information for each paper. This script is where you would modify the query, indicating which parts of arxiv you'd like to use. Note that if you're trying to pull too many papers arxiv will start to rate limit you. You may have to run the script multiple times, and I recommend using the arg --start-index to restart where you left off when you were last interrupted by arxiv. Run analyze.py to compute tfidf vectors for all documents based on bigrams. Saves a tfidf.p, tfidf_meta.p and sim_dict.p pickle files. Run make_cache.py for various preprocessing so that server starts faster (and make sure to run sqlite3 as.db < schema.sql if this is the very first time ever you're starting arxiv-sanity, which initializes an empty database). Run the flask server with serve.py. Visit localhost:5000 and enjoy sane viewing of papers! Optionally you can also run the twitter_daemon.py in a screen session, which uses your Twitter API credentials (stored in twitter.txt) to query Twitter periodically looking for mentions of papers in the database, and writes the results to the pickle file twitter.p. I have a simple shell script that runs these commands one by one, and every day I run this script to fetch new papers, incorporate them into the database, and recompute all tfidf vectors/classifiers. More details on this process below. protip: numpy/BLAS: The script analyze.py does quite a lot of heavy lifting with numpy. I recommend that you carefully set up your numpy to use BLAS (e.g. OpenBLAS), otherwise the computations will take a long time. With ~25,000 papers and ~5000 users the script runs in several hours on my current machine with a BLAS-linked numpy. If you'd like to run the flask server online (e.g. AWS) run it as python serve.py --prod. You also want to create a secret_key.txt file and fill it with random text (see top of serve.py). The server will load the new files and begin hosting the site. Note that on some systems you can't use port 80 without sudo. Your two options are to use iptables to reroute ports or you can use setcap to elavate the permissions of your python interpreter that runs serve.py. In this case I'd recommend careful permissions and maybe virtualenv, etc. over 2 years library not showing my saved papers. almost 3 years Add a LICENSE file, please. about 3 years Would it make sense to add LSA/LDA vec to TF IDF representation? about 3 years Would it be useful to have an extension to this project where you can see the ancestors and predecessors of a research paper? over 3 years Any plans for adding feature of commenting on papers? Allows searching by arXiv ID. RSS feed that will publish all papers whose updated datetime is newer than yesterday. Keep up with changes to arxiv-sanity-preserver! Would you tell us more about arxiv-sanity-preserver?